Overall Rating: 9.5 to 10! It's a near-perfect figure and I don't have to do much of anything to prep it, especially for something this size. No figure modeler can expect more than that! Nothing represents the science-fiction genera better than a soldier clad in futuristic armor. One look at the armored suit and the viewer knows that the soldier isn't representing the past or the present, but the future. There have been many futuristic designs of man-sized armored fighting suits, powered and non-powered, designed for video games, books, movies, posters, and role-playing board games. The futuristic soldier often dons a helmet, head-to-toe body armor, and usually carries a weapon. Image: ... and a 150mm. Despite the plethora of space trooper armor designs in the media, there are very few figure models depicting space troopers, and even fewer original designs. Most original armored space trooper designs are long out-of-production and thus getting increasingly rare and much sought after. Even worse, the companies or sculptors who created these original space troopers have faded back into obscurity with no method of contacting them once their molds wore away. 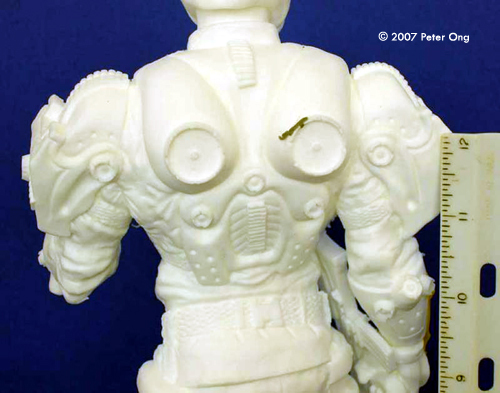 Knowing this, when I first saw Scottwhitworthstudios’s “Sky Armor Suit,” I knew this was a rare original space trooper design. What’s more, at 1/6 scale and fifteen inches tall (including the base), I knew such an original sci-fi trooper figure was almost unheard of. I jumped at the chance if I could review it and negotiated a discounted review sample. The figure, wrapped in large bubblewrap, came in a U.S. Priority Mail “Flat Rate” box ($8 fee to ship any weight the box can hold within the United States), a necessity because the box is heavy. 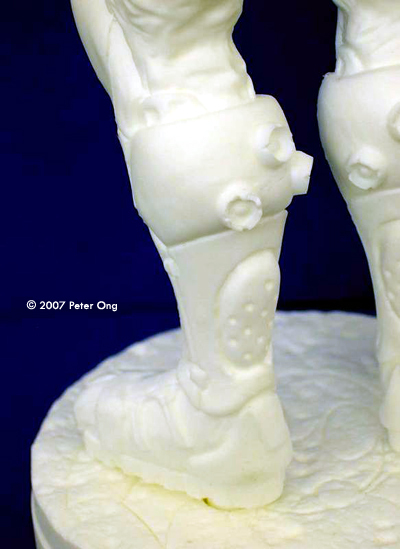 The figure itself is 100% original, sculpted by Scott Whitworth, and is cast in white resin. 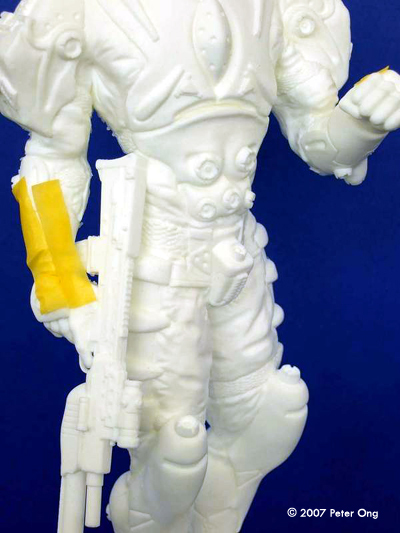 It’s a solid (quite heavy) resin one-cast piece from shoulders to boots with both arms attached. The figure itself weighs close to a pound (2.2kg) with only the head and two hands separate. 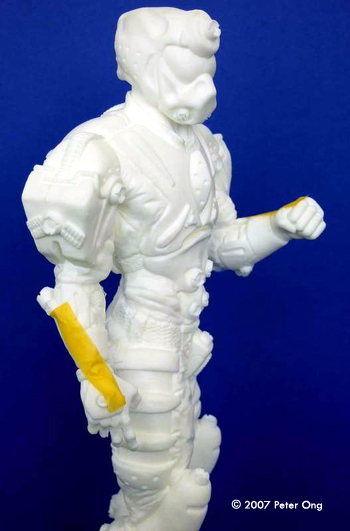 Originally, the figure didn’t come with a gun, but Scott sculpted one before sending me a review sample. The additional piece is a hand holding onto a British L85A1 (SA80) bullpup assault rifle with COMP-M “Red-Dot” sight and under-barrel grenade launcher. Upon inspection of the base, the figure, the details, and the way the parts fit, I must say that this sculptor has talent and experience. “Sky Armor Suit” is a commissioned piece done for a client, not a figure created on a whim. The design and extraordinary craftsmanship show. I saw no air bubbles, warps, runs, thin spots, mold shifts, cracks, gouges, or “lack of resin” in any of the areas. The casting of the parts appear almost flawless. In my opinion, the size and amount of resin alone justifies the cost of the kit; it’s like holding a fireplace brick for the figure, and a cobblestone for the base. 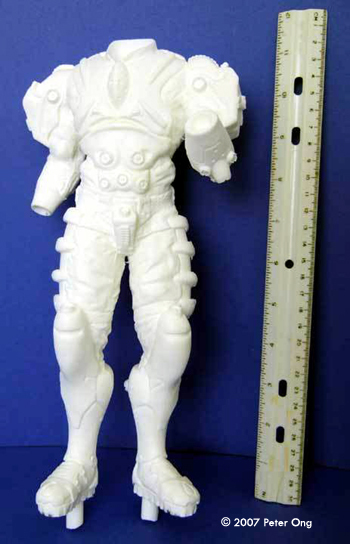 The figure itself measures 12.5 inches (32cm) tall by 5 inches (13cm) at its widest point, which will be from left to right arm bicep armor. 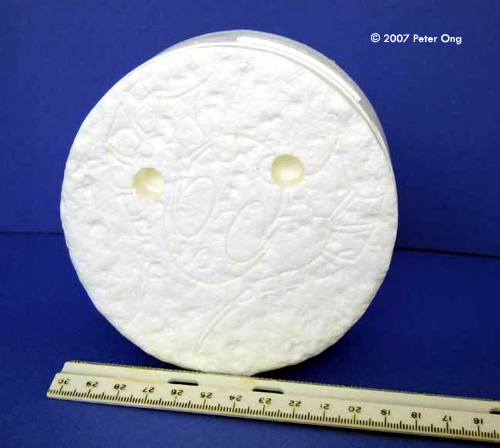 The base measures 2.5 inches (4.5cm) tall by 4.5 inches (11.5cm) in diameter. The total height of the figure on its base measures at an imposing 15 inches tall, making it one of the largest model figures I’ve ever seen and bought. 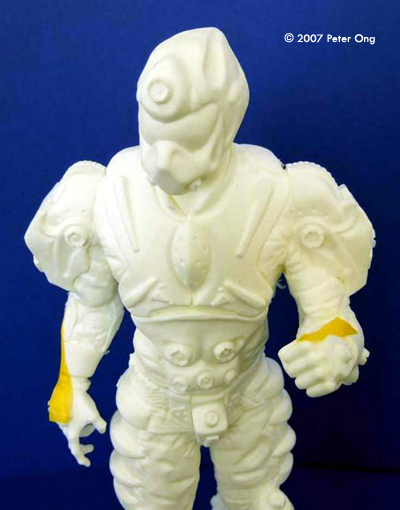 The figure’s anatomy and armor appear proportional. There are no box, photos, or instructions, but due to the few parts, construction should be inherently obvious. The hands and head all come with pins to insert into sockets on the body. I testfitted the separate parts and the fit is very good with little to no gaps. The way the parts fit allow for no deviation from the fixed pose, meaning the hands and head cannot fit or turn any other way than designed. The figure even has two metal or lead weights at the bottom of the boots’ toes to make the figure lean forward when inserted on the base so that the front of its boots will touch the base, a very nice touch and pragmatic thinking on the part of Mr. Whitworth. The figure has prominent seams running down both sides of its arms, legs, and torso. The head and hands have less noticeable seams. Fortunately, I saw no dreaded mold shift so sanding off the mold seams should result in a nice clean figure ready for priming. I did detect very minor flash around the fingers and crotch. I am very impressed that “Sky Armor Suit” comes mostly as a one-piece figure. Due to its size and weight, any gluing or joining of limbs would often result in gaps and tension as the parts try to separate from the main body due to the pull of gravity. I’ve had enough experience of superglue not sticking to heavy parts, even if the parts are pinned. A huge added bonus—Mr. Whitworth doesn’t have the modeler saw dreaded pour blocks because there are none! I can’t imagine the agony of using a razor saw to manually cut a pour block off a 1/6th scale figure. A one-piece figure without pour blocks means less work for the modeler, oh joy, oh joy! So essentially, construction means just sanding off the seams, gluing on the head and hands, and securing the figure to the base. The boots have two long pegs for insertion into the base. 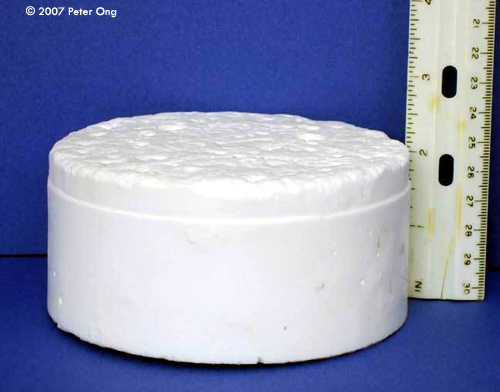 The base…let me just say it’s a huge honking piece of solid white resin! The surface depicts some barren landscape, similar to a dry creek, with line engravings (humorously) depicting an alien with two arm tentacles raised above its head as if surrendering. Or, if you turn it the other way, the engravings show two an oval head with large eyes (no pupils) and a small circular mouth. I suspect that the lines won’t be too noticeable after a coat of primer, and if they are, I’ll just add fine ballast to cover them. The sides are smooth with what appears to be intentionally perfect air bubbles holes to represent a cross-section of the planet. Scott Whitworth’s name is etched on a raised relief. I inserted the boot’s pegs into their base holes and the fit is excellent. “Sky Armor Suit” really does stand firm and balanced with the underside of both boots touching the base’s surface, leaving almost no gap whatsoever. The base’s surface has no indentations for the boots, which is fine, because the way the soles fully contact the base, there’s no need for indentations because there are no gaps between sole and base. If this kit has any weakness, I’d have point to the figure’s design itself, namely, “What is it?” The title “Sky Armor Suit” offers some explanation although I can’t help but notice that this figure isn’t geared for war. It has a belt, armor, a little backpack of sorts, and a helmet, but it lacks ammunition pouches, grenades, knife, jetpack, spare magazines, secondary weapon, or battle gear. I wouldn’t call it a space trooper although it could be made into one with a different weapon and a little imagination. The gun (L85A1, better know as the “SA80”) seems incongruous for such a futuristic-looking figure. While the gun’s casting looks sharp and the accessories welcome (rail interface system, COMP-M sight, and grenade launcher), having a weapon that dates to the 1990s and Earth just somehow seems to throw the whole notion of this futuristic figure off key. First off, “Sky Armor Suit’s” SA80 has a 30-round magazine clip and a grenade launcher, but the figure doesn’t have any pouches to store spare magazines or grenades for reloading. Secondly, the SA80 isn’t a very well-admired gun. It works, but users complain of reliability issues and lack-of-ease using the weapon. Finally, if “Sky Suit’s” armor gives an indication of the enemy’s protection level, a 5.56mm round may be seen as too insufficient to deal with the threat. 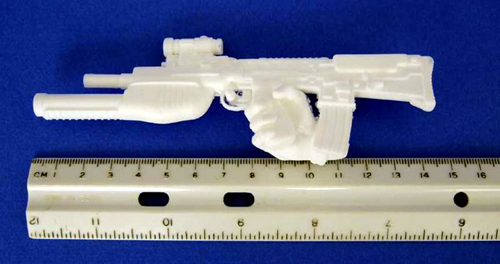 I was hoping for an original-looking laser gun and might convert the SA80 to appear more futuristic, or attempt to insert a Gundam or a more futuristic 1/6th scale doll gun into the free right hand. I stand by this conviction: “Sky Armor Suit” tops my list as one of the lowest maintenance figures I own. No pour blocks to saw, no pinning, no drilling, no filling gaps, no parts to bend to fit, no runs or blobs to sand, or gouges to fill, and no problems to fix. Construction can be finished in an hour and this figure painted in a day or two. 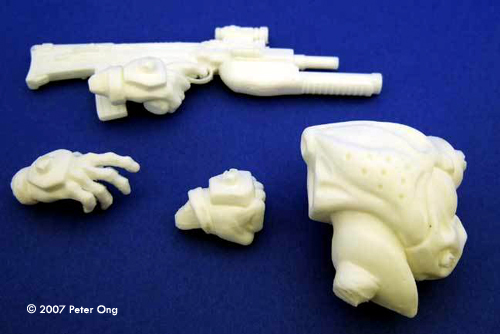 This is a trouble-free kit most modelers desire. You get quality, detail, large size, and hefty resin weight for the price you pay. The design looks good, the engineering excellent. My thanks go to Scott Whitworth for the discounted review sample. Manufacturers and retailers, interested in getting your wares reviewed and publicized on a site averaging 3500+ readers a day? Contact us! This page copyright © 2007 Starship Modeler. First posted on 12 July 2007.